In the mid-1850s, Dr. J.D. Starke, stricken with malaria, led a group of slaves, similarly stricken, to the north side of an open pine wooded lake that provided clear and clean water to avoid further malaria outbreaks. The camp built by the group provided a base of operations from which to commute during the day to work the fields near Lake Apopka and rest at night. As the camp grew into a village, it took the name Starke Lake, a name the lake upon which the group settled bears to this day. The city's population increased further after the American Civil War as confederate soldiers and their families settled into the area, including Captain Bluford Sims and General William Temple Withers who wintered at the location. Captain Sims received a land grant for a 74-acre parcel to the west of Starke Lake in what is now the downtown portion of Ocoee on October 5, 1883. In 1886, Captain Sims, along with a group of original settlers, led an effort to have the town platted and changed the name to Ocoee, after a river he grew up near in Tennessee. Ocoee is a Cherokee Indian word anglicized from uwagahi, meaning "apricot vine place" and this inspired the choice of the city's flower. On November 2, 1920, after July Perry and Moses Norman, two black men, attempted to vote and encouraged other blacks to vote, the entire black population of the town was violently attacked. On the night of the massacre, white World War I veterans from throughout Orange County participated. At least 24 black homes were burned, the institutions constituting the black community were destroyed and Perry was lynched. Before the massacre, Ocoee's black population numbered approximately five hundred; after the massacre, however, the black population was nearly eliminated. For more than 40 years, Ocoee remained an all-white sundown town. In 2018, the city commission issued a proclamation formally acknowledging the massacure and declaring that Ocoee is no longer a sundown town. Ocoee is located at 28°34′27″N 81°31′50″W﻿ / ﻿28.574050°N 81.530596°W﻿ / 28.574050; -81.530596. As of the census of 2000, there were 24,391 people, 8,072 households, and 6,554 families residing in the city. The population density was 1,843.1 inhabitants per square mile (711.8/km²). There were 8,405 housing units at an average density of 635.1 per square mile (245.3/km²). The racial makeup of the city was 81.47% White, 6.59% African American, 0.35% Native American, 2.93% Asian, 0.06% Pacific Islander, 6.22% from other races, and 2.38% from two or more races. Hispanic or Latino of any race were 15.20% of the population. There were 8,072 households out of which 44.9% had children under the age of 18 living with them, 65.9% were married couples living together, 10.7% had a female householder with no husband present, and 18.8% were non-families. 13.2% of all households were made up of individuals and 3.8% had someone living alone who was 65 years of age or older. The average household size was 2.99 and the average family size was 3.28. In the city, the population was spread out with 29.2% under the age of 18, 8.0% from 18 to 24, 36.2% from 25 to 44, 19.3% from 45 to 64, and 7.3% who were 65 years of age or older. The median age was 33 years. For every 100 females, there were 97.4 males. For every 100 females age 18 and over, there were 94.3 males. The median income for a household in the city was $53,225, and the median income for a family was $56,865. Males had a median income of $33,628 versus $26,519 for females. The per capita income for the city was $20,896. About 4.2% of families and 5.6% of the population were below the poverty line, including 6.6% of those under age 18 and 8.1% of those age 65 or over. As of the 2005-2009 American Community Survey the population was 31,544, and the city had a racial makeup of 74.9% White, 13.8% African American, 4.0% Asian, 0.2% Native American, 0.1% Pacific Islander, 5.4% some other race and 1.6% two or more races. Hispanic or Latino of any race was 16.6%. Ocoee was served by the Atlantic Coast Line Railroad. The Ocoee station burned in a fire of undetermined origin on December 4, 1928. Residents are zoned to Orange County Public Schools. High schools serving sections of Ocoee include Ocoee High School, West Orange High School. and Olympia High School. ^ "Mayor". City of Ocoee, FL. Retrieved February 4, 2016. ^ "American FactFinder". United States Census Bureau. Retrieved September 11, 2014. 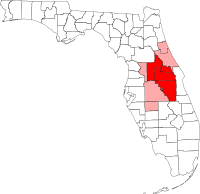 ^ "Profile of General Population and Housing Characteristics: 2010 Demographic Profile Data (DP-1): Ocoee city, Florida". U.S. Census Bureau, American Factfinder. Retrieved September 20, 2012. ^ Maguire, Nancy (September 17, 1998). "Ocoee House Is Gateway To Past". Orlando Sentinel. Orlando: Tribune. Retrieved March 24, 2014. ^ a b Fyotek, Cassandra (2009). Historic Orange County:The Story of Orlando and Orange County. Historical Publishing Network. p. 144. ISBN 1893619990. Retrieved March 24, 2014. ^ a b c "City of Ocoee" at Florida League of Cities municipal directory. Retrieved 15 September 2016. ^ a b c d e f g h "City History" at City of Ocoee official website. Retrieved September 15, 2016. ^ Edward Ericson Jr. "Dead Wrong." Orlando Weekly. October 1, 1998. Retrieved September 15, 2016. ^ Go Ahead On, Ocoee - A Narrative Documentary Film by Bianca White & Sandra Krasa. ^ Hudak, Stephen (November 20, 2018). "Ocoee, where massacre occurred in 1920, aims to shed past reputation as 'sundown' town". Orlando Sentinel. Orlando, Florida. p. A1. ^ "Geographic Identifiers: 2010 Demographic Profile Data (G001): Ocoee city, Florida". U.S. Census Bureau, American Factfinder. Retrieved September 20, 2012. ^ "NowData – NOAA Online Weather Data". National Oceanic and Atmospheric Administration. Retrieved 2016-04-11. ^ "Station Name: FL ORLANDO INTL AP". National Oceanic and Atmospheric Administration. Retrieved 2014-05-13. ^ "WMO Climate Normals for ORLANDO/JETPORT, FL 1961–1990". National Oceanic and Atmospheric Administration. Retrieved 2014-05-13. ^ Associated Press, "Station burns down", Sarasota Herald-Tribune, Sarasota, Florida, Wednesday, December 5, 1928, Volume 4, Number 51, page one. ^ "Zoning Map. Ocoee, Florida. Retrieved on April 22, 2017. ^ "Ocoee High School Attendance Zone." Orange County Public Schools Office of Planning & Governmental Relations. January 9, 2015. Retrieved on April 22, 2017. ^ "West Orange High School Zone Archived 2017-04-22 at the Wayback Machine." Orange County Public Schools Department of Pupil Assignment. January 7, 2017. Retrieved on April 22, 2017.